I am a walker and hiker in nature. And also a rower. By necessity, if I want to get to Burying Island in Taunton Bay. The island my extended family used to own in undivided shares. The island I now manage for Burying Island LLC, and for the members who now own shares in that company. I lived on the island from June 14, 1986, to December 23, 1988, so did a lot of rowing back and forth in all seasons for two-and-a-half years. 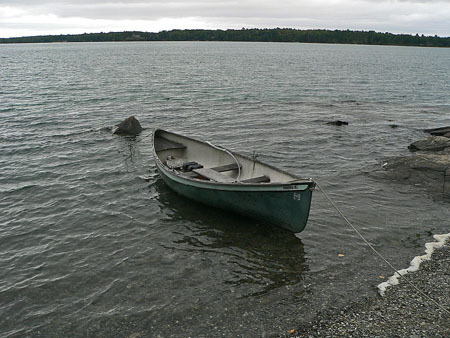 In this post I will tell of four memorable trips I made in my thirteen-foot fiberglass peapod made by Eric Dow in Brooklin, Maine. It’s called a peapod because, like a canoe, it narrows to a point at both ends. Eric made a mold from one of his hand-built wooden boats, and reluctantly (he’s a wooden-boat man) turns out fiberglass copies. That’s me in my peapod on an unusually calm Taunton Bay. 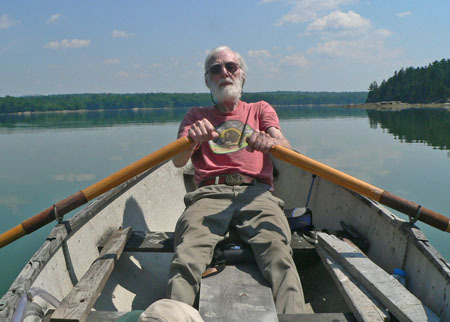 On a windless, sunny day in early May, 1987, I rowed ashore for some provisions, and on the trip back saw a jellyfish in the water right next to my boat. A big jellyfish. Half as long as my boat. Like an amethyst city in a bubble, with tendrils dangling into the depths. I’d never seen or imagined such a thing. But there it was. An apparition. A lion’s mane jellyfish brought from the Arctic by the Labrador Current that feeds into the Gulf of Maine and the upper reaches of Frenchman Bay into Taunton Bay. It was the most beautiful creature I’d ever seen, and I didn’t have my camera. I quickly eyed my position relative to ledges and rocks, rowed to the island, ran to my cabin, got my camera, ran back, rowed out to the channel—and couldn’t find it again. The tide was coming in, so I rowed farther into the bay. But it was gone. Lost, except to my memory, which provides a vivid image as I write these words some twenty-seven years later. That’s what I mean by an engagement, coordinating my senses and muscles so my whole body is focused on the same event that fills my consciousness. Not like crossing the street while talking on a cellphone or looking down at your email on a small screen. My peapod on Burying Island with Taunton Bay waiting beyond. Then there was the still September evening I rowed back to the island with a bright green aurora wafting to the north, arching over Burying Island, and reflecting in the calm bay, making a shimmering green eye with the black island at its center. And luminous phytoplankton in the bay itself, so my oars stirred up glowing ripples on the surface, and pale green drops dripped into the water when I readied for the next stroke. I’ve seen Taunton Bay under all sorts of conditions, but that was the most stunning row I ever made. The sky was alive, the surface of the water was alive, and the water itself was literally alive with phytoplankton. I took it all in, turning my head to watch where I was heading while continuing to row, my perceptions and motions proving that I, too, had never felt more alive. Once on the island, I stepped off onto the line of wrack at the edge of the tide, and it, too, glowed when I trod on it, leaving a track of luminous footprints from the plankton washed up from the bay. In February, Taunton Bay is much different than in July and August. In November, after a particularly delicious Thanksgiving dinner with Bob and Mary McCormick on Butler Point in Franklin, I rowed out into a northeast blizzard, in total darkness at ten o’clock at night, with no stars or shoreline lights to steer by, and navigated by the bite of ice pellets driven by the wind against my right cheek, pulling on my oars with all the strength I took from eating that meal. I sensed where I was going, and got into the rhythm of a galley slave to head a straight course through heavy seas by keeping the sting of hurtling ice fixed on my cheek. When the wind abruptly died, I knew exactly where I was by the map in my head—in the lee of the cliff on the north end of the island I was aiming for, the rest of my course hugging the windless shore of the island, which I couldn’t see, but could sense as a presence off to port, so I could avoid every rock and jutting point in reaching the gravel beach where I could haul up my boat, and then wend my way through snowy woods to my cabin. Despite my hosts’ pleas not to row into the storm, my expectancy after rowing through all kinds of weather, steering by hidden signs that I didn’t know I could read—those signs told me I could make it. And by believing I was a match for the risk, I made it safely, where no caring or careful person might think it possible. We learn about nature by engaging with it up-close and personally under all manner of conditions. If we give our all to it, nature will return its all to us. If we insist on only taking from nature, as we frequently do, we’ll end up with nothing. Deer have learned to walk single-file at a distance across thin ice. The last row across the bay I will mention took place in mid-March when I left a board meeting of Frenchman Bay Conservancy about ten at night and headed for my island home. 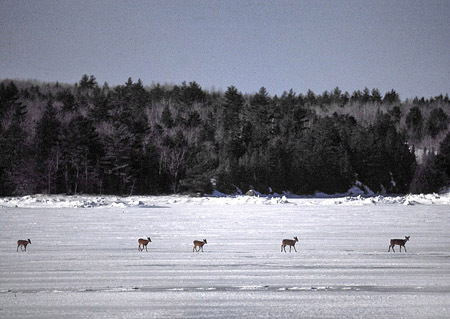 March is a month of transitions when the ice goes out of the bay and deer can no longer stroll single-file back and forth between island and mainland. 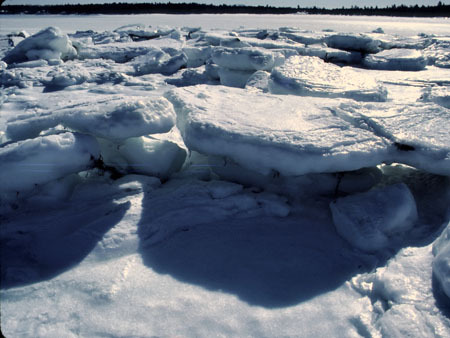 I’d equipped my boat with a flashlight lashed to the bow so I could see ice floes as I approached them. On this trip, halfway across I came to a barrier of ice running with an outgoing tide. I had no idea how large a chunk of Egypt Bay ice was going out, but I certainly wasn’t going to pass in front of it, so turned northwest along the barrier to get behind it. Finding no break in the ice, I rowed. And I rowed. And I rowed. The entire bay seemed to be emptying in that one chunk of ice. Way off course, I steered around the back end of the outgoing ice, and headed toward the unseen island beyond it, almost crashing into Burying Island Ledge before I saw it ahead, so rowed around it, too, and knew right where the island lay not far ahead in the dark water. What got me about that sheet of ice was how silent it was. No creaking, groaning, splashing to announce its presence. It was just there, blocking my route where, in my recent experience, no ice had been lately. Of course the entire bay had been frozen-over all winter, but Taunton River had been carefully reaching into the bay day-by-day, and for over a week my passage had been ice free. But this particular crossing coincided with the half-hour when the bulk of the upper bay cut loose and happened to lie between me in my boat and the island I was headed for. Learning from experience, I was prepared for just that possibility, so had put fresh batteries in my flashlight, and snugged its lashing to the boat. Caring and careful engagement opens the way to learning through experience. Which is how people are meant to pull themselves ahead by their own bootstraps. By turning their worries and mistakes to good use. Which we are fully equipped to do, even in wholly unfamiliar situations. That potential for self-teaching is the heritage that evolution has equipped us with. If we know what’s good for us, we trust that heritage every chance we get. Which is how I rowed myself safely across the bay under trying conditions, and had time to enjoy whatever scenes I met along my route.